Here is another one of those observations that made me ‘see’ past their hoax-science. On their ball model they claim the sun is behind the earth and it casts the shadow onto the moon…but how can a ball cast a straight line shadow…grab two tennis balls and flashlight and try to recreate what they claim, it won’t give a straight line down half the ball..
After researching the moon phases I’ve found numerous inconsistencies in what NASA claims. One being that both sun and first/last quarter moon above the horizon up, in the sky at the same time, proving its not the earths shadow shading the moon’s face….and also how the angles of the waning/waxing shadows are inconsistent to the suns position…and on and on. I wonder what your thoughts are on the moon orbiting the Earth. I wonder because if you get a tennis ball and write an L on the left side and an R for the right side about 2cm apart and then you hold it in your left hand and look at the ball and can see the L and the R so the L is on the left side of your face then rotate it over your head and bring it to your right hand side and while you look at it you will find that as it passes over the centre of your head the L and The R are now reversed and also upside down. Does this action happen with the moon in the southern part of our world. If the action is reversed with the moon the same as the tennis ball that would suggest the Moon orbits the Earth. 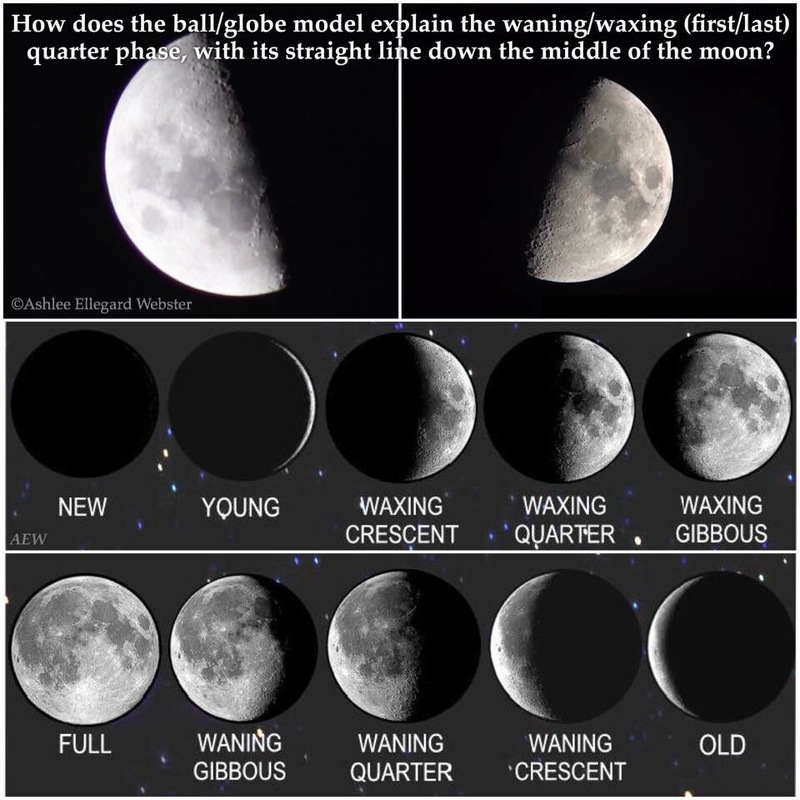 Or does the moon look the same in the North as it does in the South which would indicate the Moon circles the Earth ? Many thanks Chris.